1 of 5 Heat oven to 425 degrees F. Unroll one of the pastry crusts and fit into a 9-inch round pie plate. Refrigerate until ready to fill. 2 of 5 In a small saucepan, combine butterscotch chips and heavy cream. Heat over medium heat about 5 minutes, whisking occasionally, until smooth. Let cool slightly. 3 of 5 Meanwhile, whisk pumpkin puree, egg and egg yolk, sugar, pumpkin pie spice, salt, ginger and nutmeg. Slowly whisk in butterscotch mixture until incorporated. Spoon into crust-lined pie plate, and spread smooth. 4 of 5 Unroll second crust. 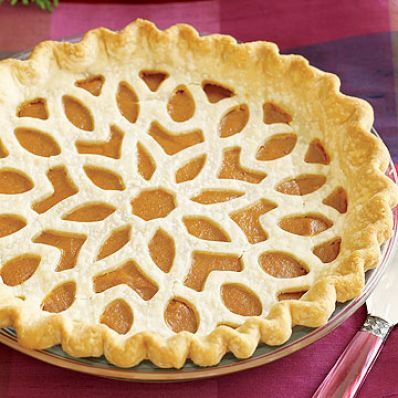 Spread on top of a lattice pie cutter (see Note), and then use rolling pin to cut and create lattice pattern. Carefully remove piecrust from lattice cutter (try not to stretch) and place on top of pie. Fold over edge and crimp decoratively. 5 of 5 Bake at 425 degrees F for 25 minutes, then reduce oven temperature to 350 degrees F and bake an additional 35 minutes, until crust is browned and pie puffs slightly, covering edge of pie with foil if browning too quickly. Cool at room temperature on a wire rack. Serve with whipped cream or whipped topping, if desired.